Manoeuvres started out in 1985 under the group name Wea Dynamics the first dance step that they introduced was the Harlem Shuffle, which they first promoted in Student Canteen. 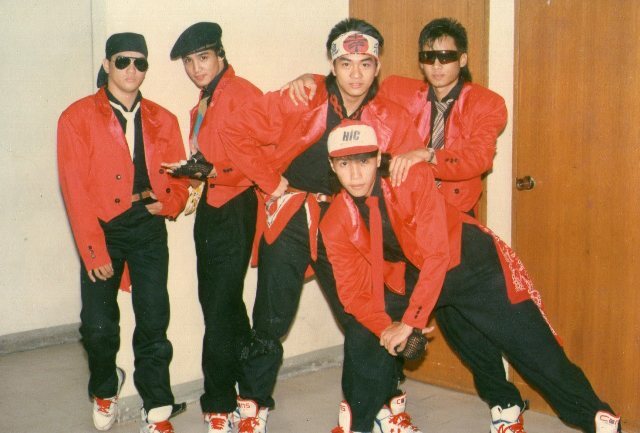 In 1986 they moved to OctoArts, the publicist then of the company Ms.Aster Amoyo gave them the name OctoManoeuvres, the original members of the group include Uriel Policarpio, Ronnel Wolfe , Jon-Jon Supan, Rene Sagaran and Jojo Lapena . They became regular dancers of That’s Entertainment, LotLot and Friends and Lunch Date they performed also in SM malls introducing new dance steps and promoting the album of the artists. Slowly the group began to be recognized as one of the finest dancers in the music scene having a followers of there own, they were more known to be doing the Michael Jackson (Bad and Smooth Criminal) this are the moves that they have done and made a mark to the people especially to the young crowds. Until one of there group member Ronnel Wolfe decided to leave to pursue his showbiz career as a singer, they needed a replacement. Therefore, they held an auditioned at the OctoArts office, Jason Zamora was one of them who tried his luck, and he danced with so much energy, which is one of the qualities that the group needed luckily he was chosen. Joshua Zamora and Jon Cruz were both regular dancers of Lunch Date they replaced two of the members Jon-Jon Supan because he wants to continue and finish his course in business management at Letran and Jojo Lapena went to Japan. Interestingly enough all these people took blue-collar jobs before they became part of the widely popular group. Rene Sagaran worked at Gillette, Jon-Jon Supan after college he worked as a dealer at Coca Cola, he also worked as a Med Rep and insurance agent, and at the same time, he went back to Manoeuvres. Jason Zamora and Brother Joshua both work at the same club as a bartender and cashier when they were young .The latter also tried his hand vending perfume door to door. All of them shared the same dream. They wanted to make a name for themselves as dancers. Nineteen Eighty Seven they had the opportunity to work with Mr.Gary Valenciano in his solo concert Pure Energy at the Folks Arts, and then followed by in 1988 concert at the Araneta Heart and Soul. They later signed with Genesis in 1989 with a new name Manoeuvres according to their choreographer Uriel Policarpio, Gary did not hesitate taking them because they share the same taste, their stint with Gary paved the way to a more fulfilling career, they have traveled to different countries and parts of the Philippines in Gary’s nationwide tour of “Shout”. Danced and wooed by audiences with their funky moves. Dancing has given them fame, they are considered the same as those who were ahead of them, they have always given more than 100% in every show they do. What have given them the strength aside from God, are their fans as they stated,” It’s always their dream to be applauded for our art of dancing rather than our looks”. On their tenth year they did a dance concert titled “Man At Large” which they held at the Star Complex Nov.5, 1994 because of the success of their first concert they did a repeat which they held in Heartbeat in September 9, 1995. The Manoeuvres dedication andcontinues effort to improve their craft makes them a cut above the rest. No one can contest the fact that the group does not dance for the sake of dancing. They have made street dancing an art itself. They put real rhythm and harmony in each step. Each move is accurate-not a step wider or a move bigger than the rest. For them, everything should be done in unison. Their splendid exhibition did not go unnoticed for no less than dance guru did. They were also included in such films “Hataw Na” with Gary, “SPO1 Don Juan” with Leo Martinez. They embarked on a mall and campus tours called “Dance Away with Drugs”, wherein they displayed other skills aside fromdancing. Every summer they have a dance workshop for young people at Trumpets Shangrila who want to learn their dance steps and be more fruitful during their vacation. It was not all fun and frolic for the group. Their biggest setback was when longtime member Totit Gonzalo passed away five years ago. “Totit’s death opened up a lot of things for us we realized the value of life” says Jon. Their group was shaky at that time with no one to turn to. When Totit died their group was revive and their faith became stronger Totit became the instrument to be closer to the Lord, they think that it was the Lord’s way for them to unite. Weekly delving into the bible did wonders for the Manoeuvres not just being able to accept the loss but also helping them to become better persons. They were able to grow spiritually and gain wisdom. Therefore, the key to success of the Manoeuvres is not just their attitude and discipline towards work. It’s the message these men have been trying to spread all these years:” Go against the flow. Get rid of cheating, of vices, of pride. You must put God first, in whatever you do. Work for the Lord that way you will have life that is more meaningful. Spoken like true Christians who all share the same passion for dancing. With these thoughts in mind, the Manoeuvres wish to share by performing several shows. For 19 years made a name for themselves as the country’s premier all- male dance group went through a period of trials in their lives and managed to get themselves together, and earned success through constant hard work, being creative and going against the flow. Truly, they are an inspiration not only to the young crowds but to everybody each has his own stories to tell that we can all relate.